Fitness Meme of the Week: Keep Going. No. Matter. What. 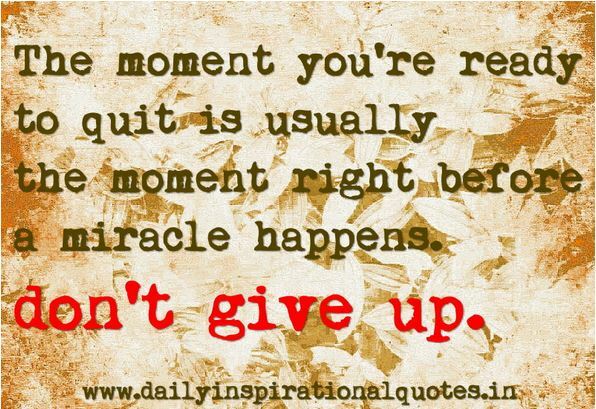 I hesitate to write “Don’t Quit” here…because I’m not the biggest fan of “Don’t” statements – but it’s true. Keeping going with the things we know we’re really supposed to be doing is really the only way to succeed in anything. And getting rid of the things we’re not supposed to be doing – those “safety nets” that are really anything but safe, because they can hold us back and keep us from thinking creatively about getting where we want to go – is a key part of that process. Have a great holiday weekend. See you next week. Yesterday’s #Every48 workout: A wonderful, wonderful BIKRAM YOGA class at 4:30 p.m. That’s the witching hour at Wellness Playbook Central – the time when I need to get out of the office and do something other than stare at a computer screen. I got three different ideas during that yoga class about issues that were keeping me gummed up at the office, just by stretching my body. Love it. Previous Post Throwback Thursday: Build Thee a Capillary! How exercise upgrades your body in ways we can’t even see. Next Post Monday “What Went Well”: It’s a holiday. Get out there and get your move on.